This six-lane expressway includes 16 viaducts, each containing post-tensioned beams 36 metres in length. In total, 1300 post-tensioned beams were installed. CCL was involved in the precasting, the post-tensioning and the installation of the beams. In order to carry out the installation successfully, a launching girder was used. The project, which was completed in 2008, presented many challenges for the company. Two of the most significant were the mobilisation of the launching gantry itself and the subsequent demobilisation, both of which had to be carried out 16 times. Difficulties were also created by the geometry of some of the viaducts, which included longitudinal slopes of 6% and in-place curvature. The length of the precast beams also caused problems, with regard to transportation. The precast beams were cast in three seperate segments to facilitate transportation from the precast yard to the construction location. 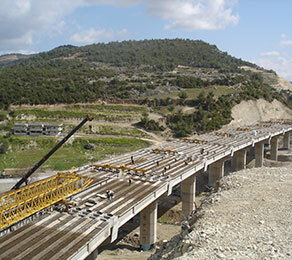 Once on site, they were assembled and the post-tensioning was carried out behind the abutment of the related bridge. They were then installed using the launching gantry. CCL’s ability to successfully overcome all of the above challenges resulted in the construction process being completed on schedule and with maximum efficiency.